I’m pretty sure that potato salad is universal. For the most part, each country has a version of this comforting and versatile side dish (who am I kidding, sometimes this “side” dish becomes a whole meal for me). 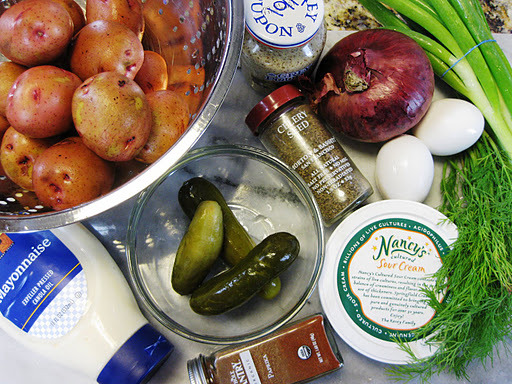 I grew up eating the traditional Russian potato salad – loaded with potatoes, pickles, carrots, peas, eggs, dill and, of course, mayonnaise. Later on in my life, I became a fan of the American version, and have also had a chance to try German and Spanish potato salads. This is the salad that you want to make ahead of time to let the flavors shine. 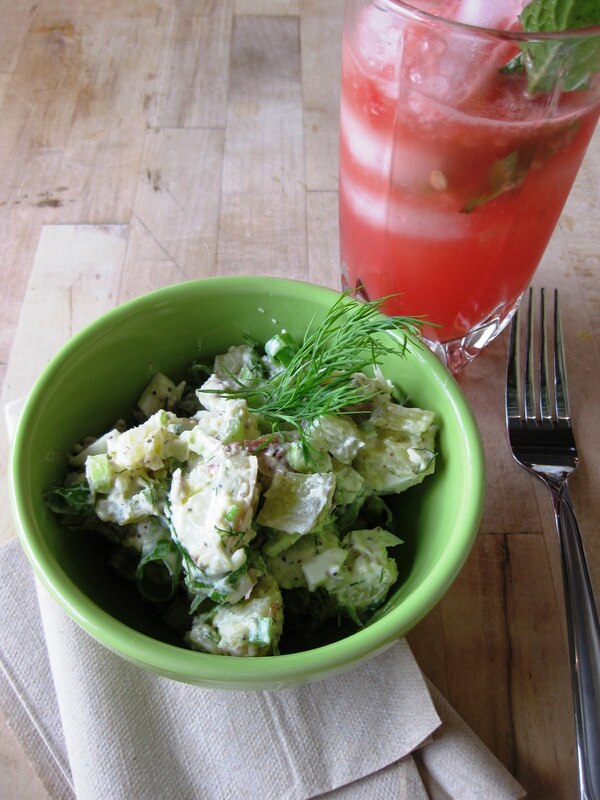 Do save some of the scallions and dill to add to the salad right before serving it to your guests. And be sure to make enough to have leftovers for yourself for the next day or two. 1. 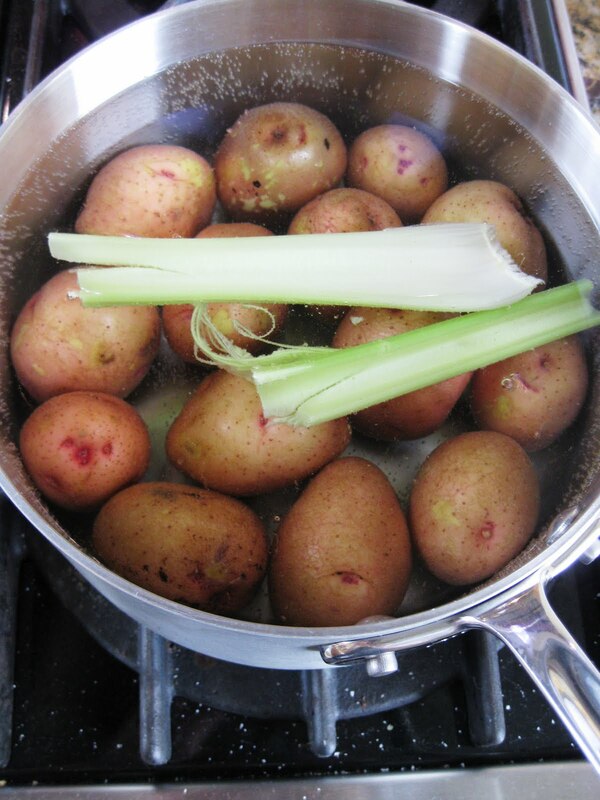 Place potatoes in a large pot and cover with cold water. Add a healthy pinch of salt and a few stalks of celery (you can also add some garlic and pepper corns – these will really add extra flavor to the potatoes). Bring potatoes to a boil and turn down the heat. Simmer potatoes, partially covered with a lid, until they are tender, about 25 minutes. Discard celery and drain potatoes. Return potatoes back to the pot to dry completely. A few words about potatoes: it will a lot faster to cook diced or quartered potatoes. However, cooking them whole, preserves their texture and keeps them more flavorful, less water diluted. Peeling new potatoes is really unnecessary. The skin is very thin and holds plenty of nutrients. 2. Cook eggs while the potatoes are simmering. This is the perfect, almost fool-proof way to cook eggs. 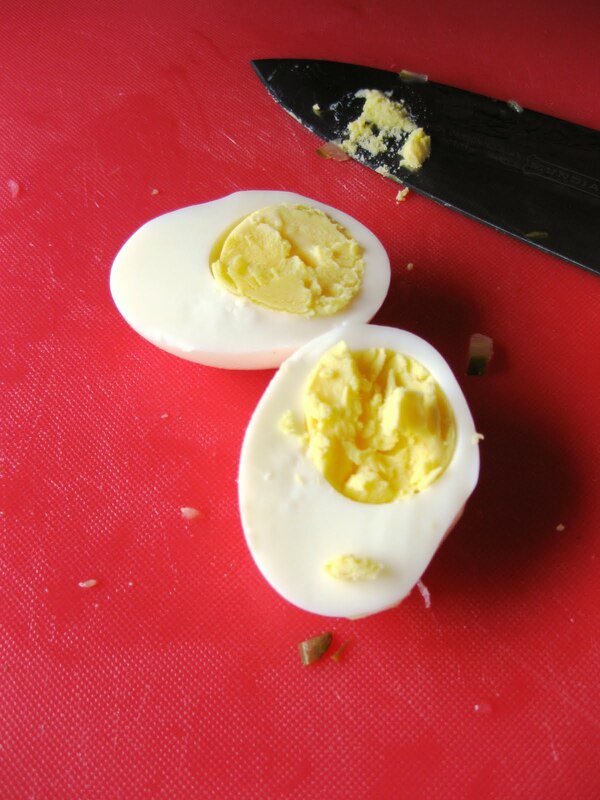 You will get the perfect, bright egg yolk, without the embarrassing and unappetizing green cover. Put eggs in a small sauce pan and cover with cold water, add a pinch of salt (the salt prevent the eggs from cracking). Bring the water to a boil, cover the sauce pan from heat and allow to stand for 15 minutes. Remove the eggs and run under cold water, until completely cool. Peel and roughly chop the eggs. Did you know that it’s a lot easier to peel the eggs, starting from their fat end? 3. Time to make the dressing. 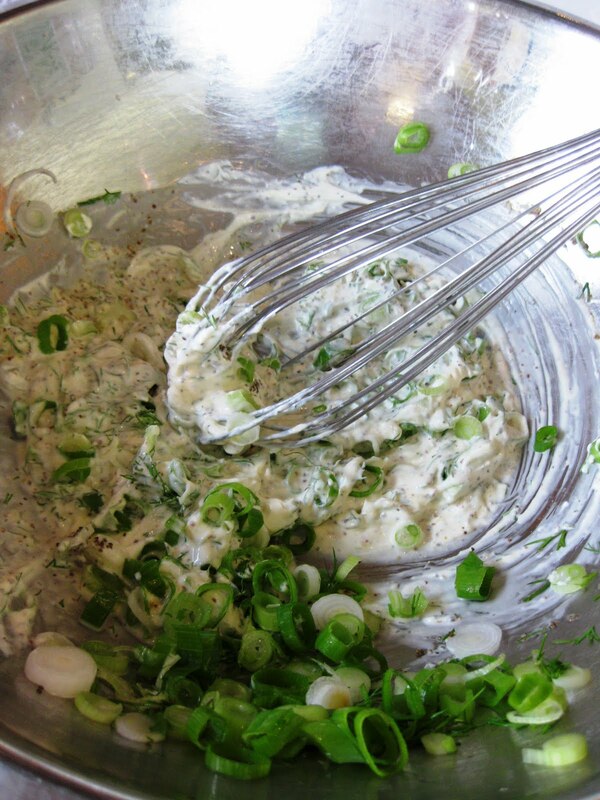 Whisk together mayonnaise, sour cream, dill, mustard, scallions and celery. Add pickles, pickle juice, lemon juice and celery seed. Adjust the taste with salt and pepper. 4. With a rubber spatula, fold in potatoes and eggs. Cover and refrigerate. 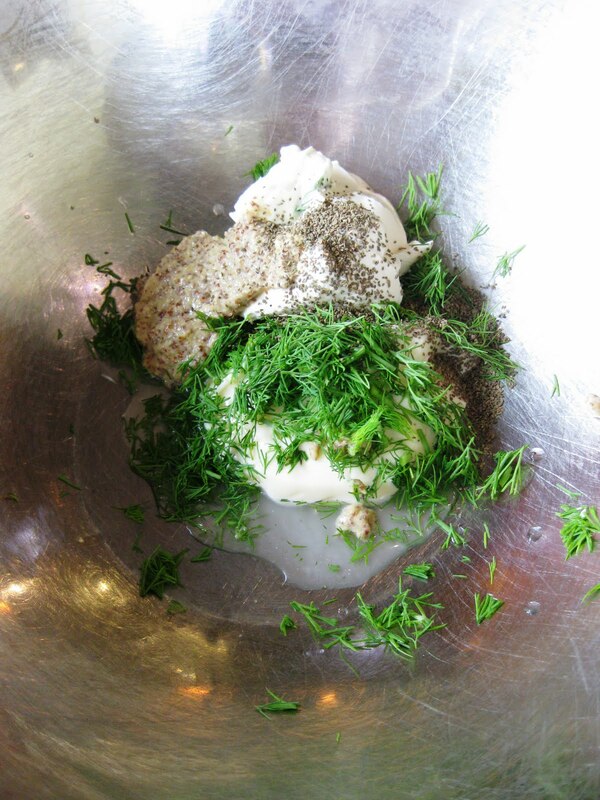 Serve with a garnish of dill and paprika. Click here to to find out what’s the gorgeous drink in the background! 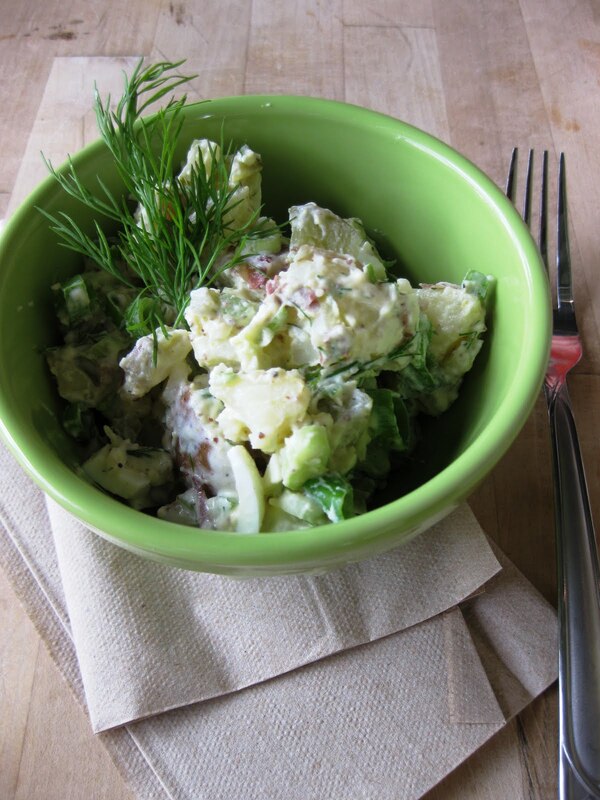 What’s your favorite version of potato salad? 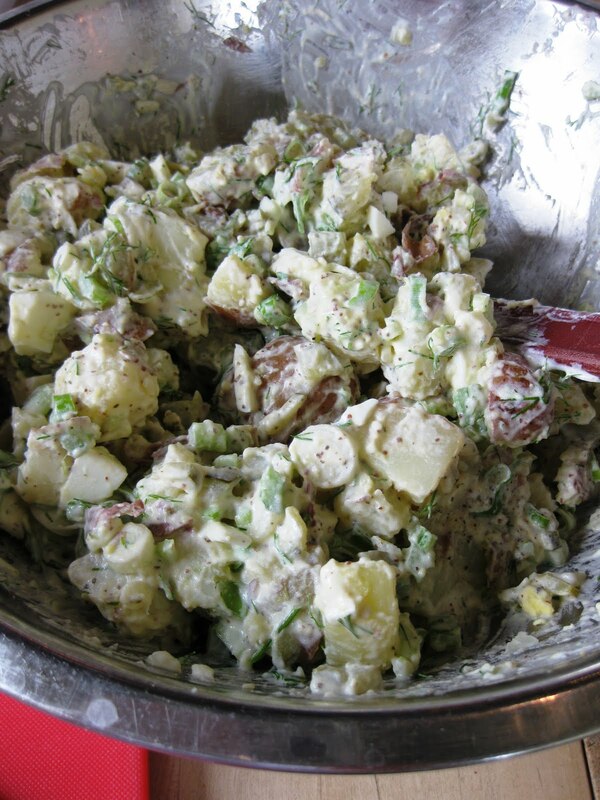 Funny enough i made potato salad today….to eat tomorrow. I used my mom's style of "chopping" the onion, which meant I grated it. Makes it so much nicer to enjoy. YUM! I'm going to have to give this one a try! Anything with dill pickles in it! Yummy!